If you are fan of curries this is a must try. Buttery green peas in a lightly fragrant sauce that is not overpowering. It is a curry where the spice and the beans play equal parts in flavoring. 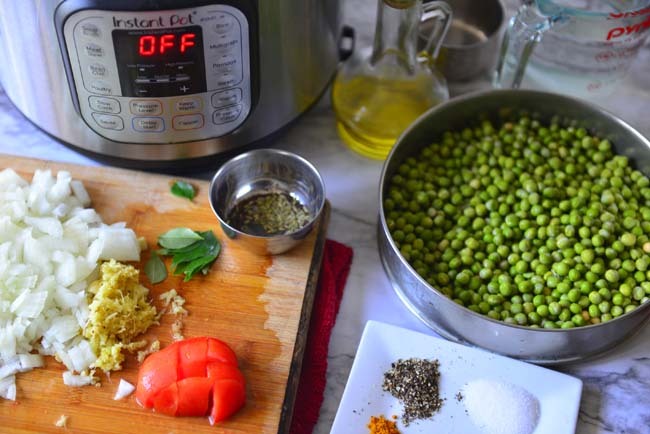 An instant pot or a standard pressure cooker makes cooking peas easy. 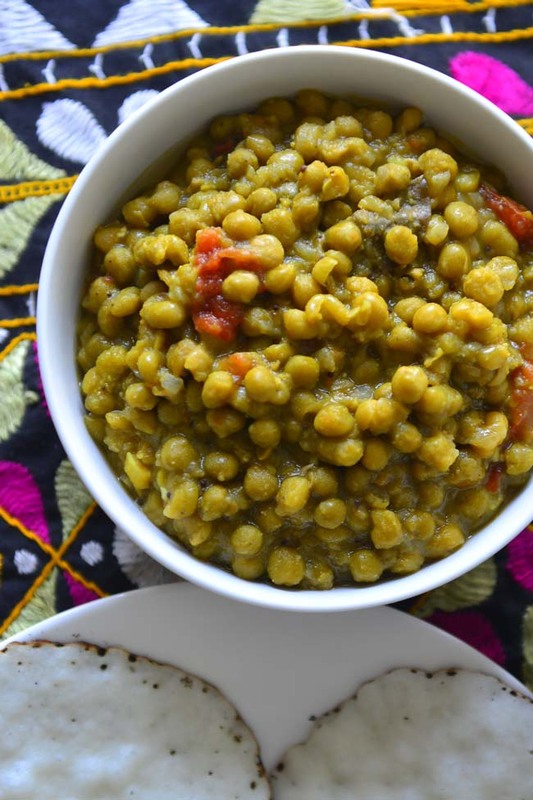 Green peas curry is popular all over south India. 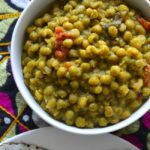 There are many version of green peas – some are called as peas curry , others peas masala or dhaba style peas curry depending on how much spices are added. 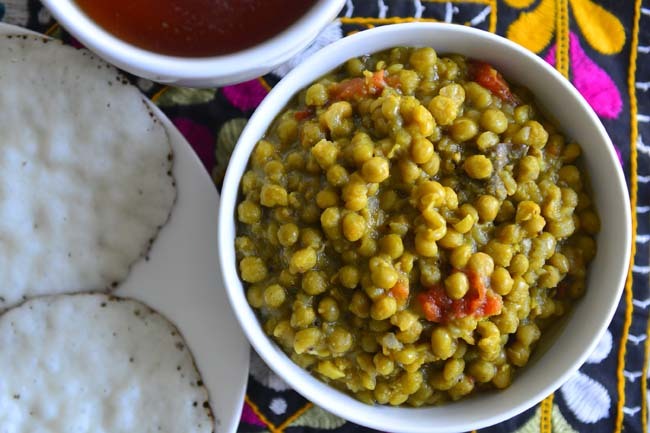 This version is mild and inspired by the peas curry served for breakfast in Kerala homes. Peas curry or peas masala was served with almost all types of breads and sometimes even rice. 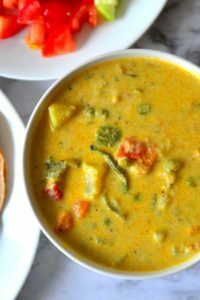 This curry is the perfect consistency to be scooped by chapathi or poori, served over the fresh rice noodles called idiyappam or serve with a richer bread like parotta. Green Peas curry was a favorite among the children and adults alike as long as I can remember – okra, squash and bitter melon were all polarizing vegetables but not peas! Of late my family has jumped on this bandwagon as well. Appam and peas curry has become the new favorite, surpassing appam and ishtu ! Green peas is a nutritious legume , so who am I to complain? Dried green peas have a hardier flavor compared to fresh peas. These are easily available throughout the year as well. The taste and texture of dried peas make it the ideal choice for a satisfying curry. The dried green peas, like many other legumes , take long time to cook. Soaking the peas for 6 to 8 hours reduces the cook time. As an added benefit all the peas get cooked evenly. 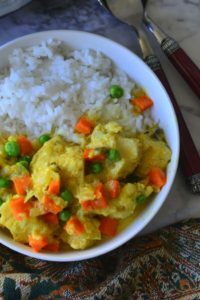 Pressure cooker or your Instant Pot is the best equipment to make this curry. In case you decide to use the stove top method, the directions are same except t hat you have to increase the amount of liquids used and cook for much longer. A programmable pressure cooker, like an Instant Pot, cuts down the hands on cooking time to 10 minutes or less – what is not to like about that ? There are not many spices used in this curry. The base for the curry is made with onions, and tomatoes. The standard curry spices like coriander, turmeric, and garam masala are here as well but in moderation. Black pepper goes best in this dish compared to chili powder. A little goes a long way. Another advantage is unlike red chili powder black pepper does not change the color of the dish. There are green chilies in this dish, but these are left whole to just add flavor without increasing the heat. If you are on the adventurous side go ahead and slit the chilies. Fennel is the sweet spice here – the aromas and mild sweetness goes perfectly well with the flavors of peas. Here is how to make it in steps ! Heat the oil . Add fennel, mustard seeds, and curry leaves to the hot oil. Saute the chopped onions, ginger and garlic along with green chilies if using. Add peas, water , a little salt and cook till done (Refer recipe). Try these other instant pot recipes. Waking up to Appam , Peas Curry and Mug of Black Coffee. Yes life is simple sometimes! 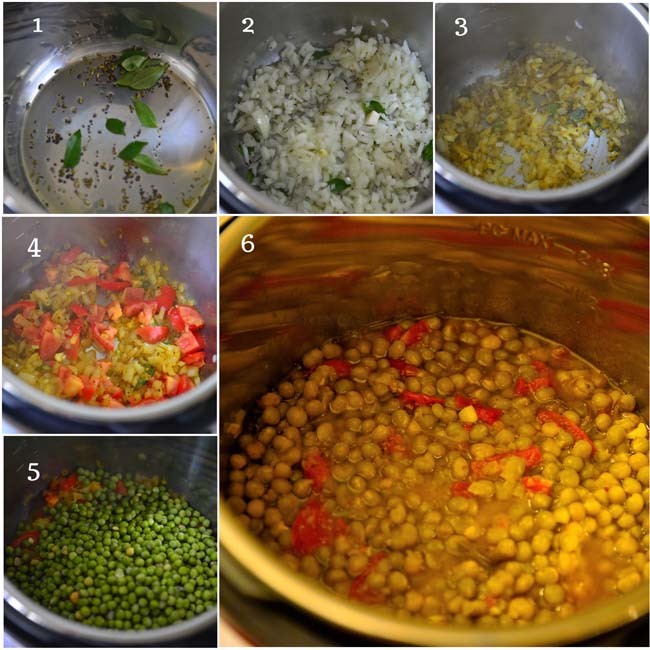 Soak the dried green peas in plenty of water for 6 to 8 hours or overnight. Rinse and set aside. Chop the onions fine, finely mince or grate the ginger and garlic. Chop the tomatoes into small pieces. Set the instant pot to saute to saute mode. When hot add the oil. After 30 seconds add mustard seeds, fennel and curry leaves. Let it cook for 30 seconds to 1 minute or until the mustard seeds pop and the fennel becomes fragrant. Add the chopped onions. Sweat the onions cook for 1 minute and add the ginger and garlic. Stir and cook 1 minute and add the spice powders. Cook for 30 seconds or until the spices are heated through. Add the chopped tomatoes. Cook for 2 minutes or until the tomatoes turn soft. Add the drained peas and water along with 1 tsp salt. Close the instant pot. Cancel saute program. Set the vent to sealing. Cook on manual high pressure for 15 minutes. Once the cooking is complete let the pressure release naturally . Open the lid, stir and check salt. Adjust salt if needed. Serve! 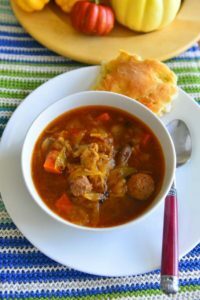 Follows the same steps as instant pot up to adding peas. In pressure cooker add about 1 C water and cook according to manufacturer’s instructions for dried beans. Follow the steps up to adding beans . Add the beans to the pan and with 2 c water, cover and bring to boil. Reduce the heat to medium and cook for 40 minutes to 1 hour. Check the water about 20 minutes int cooking and add more if necessary . Use Thai, Serrano, Jalapeno, or Cayenne chilies in this recipe. The chilies are used for flavoring only, so leave them whole if using. If a spicier version is preferred increase the pepper. Use your favorite brand of garam masala or make your own. Here is my recipe. Traditionally this curry is made with coconut oil, use any neutral flavored oils. For more gravy add coconut milk after the peas has finished cooking. If doing so increase the amount of garam masala and pepper. Signup below ⇓ ⇓ if you haven’t already !!! I promise NO SPAM !